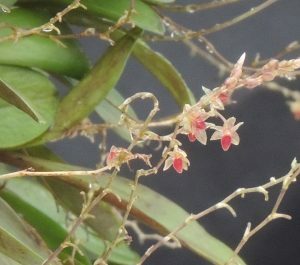 This is the second Platystele to feature in 365 days (see Platystele misasiana Day 85) and this one has 1mm flowers that bloom successively on spikes over a long period. This means that plants are surrounded by a little cloud of flowers for most of the year. The flowers are well worth a close look with a magnifying glass especially the contrasting salmon red lip. 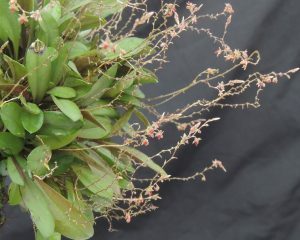 As with most of our miniatures from the cloud forests of South America this species thrives mounted and well watered in Cool Americas.